Monoblue Obsession vs. unknown opponent in quick constructed. He goes first. That made me think. If he attacked I'd be forced to block, since he can trade Fanatical Firebrand for Siren Stormtamer at any point, the only reason he's not using it is because he thinks he has a better line than trading. What could it be? He's clearly not holding another 1- or 2-mana creature, but next turn is the Chainwhirler turn. That would make his non-attack sensible. Meanwhile I suppose I might as well attack him back, since if I don't, he can still kill Siren Stormtamer next turn anyway. Me T2: Land, attack you back, go. Him T3: Land, Goblin Chainwhirler. I Essence Scatter. Yeah, knowing decks is very important. Deep in a game vs. RDW, Azcanta and Teferi have helped me take control as I dig for a finisher. Sitting at 6 life, the opponent has one card in hand. He draws, plays a land, and Banefires my face for 6. I cast Vraska's Contempt on my own Teferi to gain the 2 life, slam another Teferi from hand next turn, and take over. I get Lyra out before he can draw into into any other Banefires supposing he had another, and I glide onto victory. Also, from a few days ago, I was playing Selesnya Tokens vs. Jeskai Control. I'm beating him down with a fair number of threats, then he plays Settle the Wreckage at 6 mana. 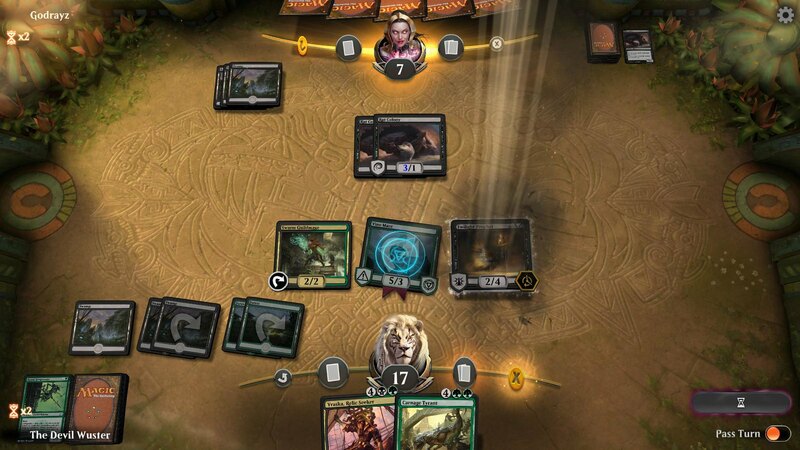 I cast March of the Multitudes in response (since a number of my attackers were Benalia knights with vigilance), but make sure to not use a single mana, because the only relevant counterspells are Negate and Syncopate. Negate is unlikely to be maindecked and spending all but one mana on MotM didn't change my clock, so it made sense to keep the mana open. He tries to Syncopate, I can pay the mana, my tokens finish him off in 2 turns. Had Resplendent out and attacking. That one ate removal. Played another I had in hand, drew another. They didn't want to lose their Reach card so she got in a couple times as I put the third one on board. They play Doom Whisperer and next turn attacked, I'm sure thinking there is no way I'm going to block. I block with both Angels. .......guess what I had in my hand? Yup, the fourth Resplendent and now six mana to set her off next turn and lock in the game. But was double blocking the best option? If you take the damage, you could simply take over the game with the 2 Angels you already had, right? Were you in a critical life spot? I actually could take the damage but didn't want to keep contending with the Whisperer in trying to get my damage in, knowing I had another Resplendent ready to play in second main phase, so I made the big sacrifice. But if you swing back and pump, you gain 5 life, and churn out 8 additional points of vigilant power, and THOSE angels could have theoretically double-blocked Whisperer. Was the other guy tapped out when he swung in? What was the risk of removal resulting in a blowout? I did swing and pump the next turn. I didn't get my 6 mana until the turn I attacked with the last Angel. I'm with divinevert actually. If you double block now, and opponent had removal, you're actually in trouble. If you can afford to take the 6 damage, take it - you swing back for 6 after all so it'll be a close race, and if you do draw a land you'll make two angels when you activate Resplendent Angel. I can't count how many games I have won when I played Telfari and my opponent just conceded. There have been games when I am at like 6 life, they have some 2/2 creature out and I have 3 land in hand. I play Telfari, and am thinking, Hmm....should I bounce his creature and basically write off Telfari when he plays another creature, or should I draw a card and gamble I get removal? And then my opponent concedes. I swear, 1/2 the power of Telfari is psychological. If I put down Karn, and just used his card draw, would I still get these concessions? Sometimes, that is all Telfari is, extra cards and a bounce effect. I am not saying he is weak by any means, but he is not the auto wim some apparently think he is. Draft, playing Izzet, opponent plays selesnya with an impenetrable board and dozens of chumps. My board is pistonfist, beamsplitter, he just killed my 3/4 5cmc flier (the blue one) with harpooner and swung in with his healers hawk, he's at arpund 13 life. Perfect card to play against a Rat Colony deck, in Singleton no less. I call that a Play of the Day. Damn, 2nd hard fought 7-2 from 1-2... Both decks featured Risk Factor which has proven great. Poor Rat-players. They were off bad enough on the opening weekend, now that everyone has Mythics they're just getting butchered. I played 2 events yesterday, ended up 4-4 with Selesnya Token Mythics (well, what I have) and faced roughly an even split of mirrors and Golgari Mythics. That Twilight Prophet stinks! The Prophet has come in really handy honestly. The flying has been a big plus as I'm not encountering much other flying in Singleton although Guilds does have a few more reach cards it's brought with it. What's really been nice is Prophet's late game with the Blessing and the bombs my Singleton deck has. Lethaled an op out last night with the damage done by Prophet's draw. Just met another Rat deck. Poison-Tip Archer, plenty of Saprolings and another Vine Mare takes the win!